EL PASO — President Donald Trump dedicated 14 minutes of his State of the Union speech Tuesday to paint a picture of a southern border under siege — with waves of undocumented immigrants pouring through and bringing a surge of violent crime to the U.S. — as he urged Congress to finally fund his long-promised barrier on the country’s border while the clock ticked down toward another possible government shutdown. 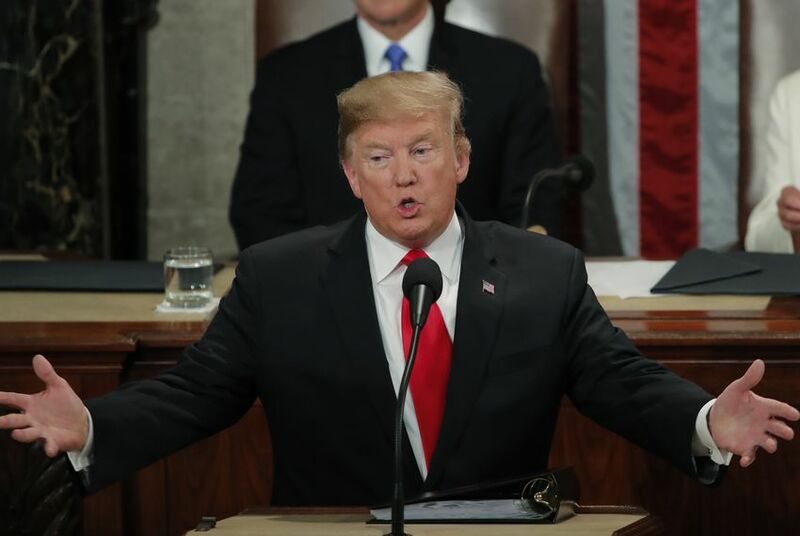 Immigration and border security dominated the middle of a speech that stretched more than 82 minutes, and Trump made references to MS-13 — a brutal Central American street gang — human smuggling and trafficking, and illegal drugs entering country through the southern border. He also doubled down on his claims that El Paso and San Diego were dens of violent crime until the current fence was built in those communities and jabbed at veteran lawmakers whom he said supported former President George W. Bush’s Secure Fence Act in 2006. His address comes just a little more than a week before funding for some federal government agencies, including Customs and Border Protection and the U.S. Border Patrol, runs out after a temporary agreement between Trump and Congress bought more time to negotiate a solution to the stalemate over border barrier funding. Trump's insistence that any agreement to continue funding the government come with more than $5.7 billion for a border wall sparked the longest government shutdown in U.S. history starting in December. The president used the latest caravan of Central American migrants as another example of why Congress should act immediately and to justify his decision last week to send nearly 4,000 active-duty soldiers to the border. The caravan left Honduras last month, and about 1,700 of its members arrived in Piedras Negras, Coahuila, which sits across the Rio Grande from Eagle Pass. Trump also repeated a dubious claim that El Paso was one of the country's most dangerous cities until the Secure Fence Act of 2006 was passed and several miles of barriers were built in the border city. After the speech, Ali Noorani, the executive director of the National Immigration Forum, said Trump used "fear rather than facts to paint an inaccurate picture of our southern border and manufacture a crisis where none exists. The truth is that our southern border has never been more secure, and the overwhelming majority of drugs smuggled across our border come in through ports of entry — a border wall would neither make us safer nor stop drug smugglers." Trump first made his claim about El Paso last week, drawing the ire of local and state lawmakers who pointed to FBI statistics to refute that assessment. A fact-check of the president’s speech published by the El Paso Times on Tuesday noted that violent crime in the border city peaked in 1993, then fell by more than 30 percent between that year and 2006. Construction of the barrier in El Paso didn’t begin until 2008, the Times reported. El Paso’s crime rate has continued to drop in the years since, from 457 crimes for every 100,000 residents in 2009 to 393 in 2014, according to FBI statistics. Democrats and border officials quickly came to El Paso's defense Tuesday night. U.S. Rep. Joaquin Castro, D-San Antonio, said Trump "paints a very scary and unfair picture of our border cities, particularly in Texas ... but the people of Texas know that the president is lying, that these are wonderful places, that they're safe cities. "I think even [Texas U.S. Sens.] John Cornyn and Ted Cruz would tell you that, and if they wouldn't, then I dare them to go to those places and say differently," Castro added. Jon Barela, CEO of the El Paso-based Borderplex Alliance, chided Trump for what he called false comments about El Paso and the border that "are detrimental to business development and job creation. El Paso was safe long before the wall was built." Congresswoman Veronica Escobar, who represents El Paso, said on Twitter, "He lies. @POTUS is once again lying and using the #SOTU address to spread falsehoods about our beloved city of El Paso. Fact is that El Paso has been one of the safest cities in the nation long before the wall was built in 2008. #WallsDontWork"
But Trump's warnings about border security brought praise from fellow Republicans like freshman U.S. Rep. Chip Roy, who was attending his first State of the Union speech. "He did a fantastic job articulating the positive state of the union today," the Austin Republican said just outside of the House chamber. "And I think he also made a strong case why we need to secure our southern border and why it's critically important for the wellbeing of American citizens, for the migrants who seek to come here who are constantly being abused and left in indentured servitude, to cartels who have operational control of our border, so I think the president laid those out and I think it was a good speech." Texas Congressman Brian Babin, R-Woodville, said Trump has "repeatedly put forward clear plans to secure our border. Democratic leadership has adopted a strategy of obstruction, putting forward no plan other than open borders, mass amnesty, sanctuary cities and abolishment of law enforcement agencies like ICE. I am proud President Trump has been willing to seek compromise with the Democrats before acting unilaterally, and I hope the border security conference committee can put forward a plan." During Trump's speech, former Gov. Rick Perry, now the country’s secretary of energy, was chosen as the “designated survivor,” the title given to a person — usually a member of the president’s Cabinet — who would assume the presidency should the president, vice president and speaker of the U.S. House be incapacitated due to a disaster or an attack. Julián Aguilar contributed reporting from El Paso, and Gabe Schneider and Abby Livingston contributed reporting from Washington.